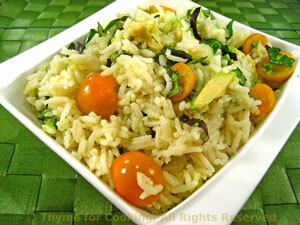 Basmati Rice Avocado Pilaf, Thyme for Cooking healthy gourmet side dish. Fragrant Basmati flavored with creamy avocado, a few tomatoes, fruity olive oil and fresh herbs. Simple for summer. Add rice and sauté, stirring for 1 minute. Add stock, cover and cook rice for 15 minutes. When rice is done fluff with a fork and put into a bowl. Add remaining ingredients and stir gently.